Andrew Morgan’s Peoples Potential Unlimited introduces another hidden talent. Max E. Monroe, the man behind The Trash Company, started composing in 1970’s and is only now preparing his first album for Steady Sounds. Before that, a single works as an appetizer. 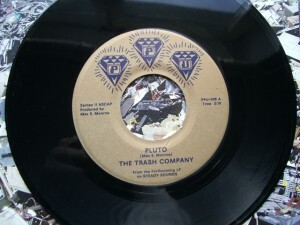 The A-side of the wide-hole seven-inch suggests to wear a neon headband for full-bodied 1980’s synth funk titled “Pluto”. On the flip a real mid-tempo power cut called “For The Hook”, a robotic crossover reminding of Robert Hood’s “Rhythm Of Vision”, Syncom Data’s metallic dub funk and Fortran 5’s chopper techno. To round up the story about Monroe, this site tells the artist has got two birth certificates because he was born on the highway somewhere between Baltimore and Richmond. And the guy keeps traveling on interesting roads.